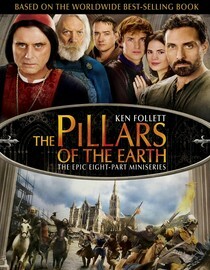 The Pillars of the Earth is an 8-part miniseries that centers on the construction of a cathedral in 12th-century England. The series is from the Starz network so you can't expect the production values of an HBO show or all the hot sexin' of a Showtime series but the story is good, the acting is good, it doesn't look cheesy and you do still get some sexin'. I really enjoyed the series and if you like shows like The Tudors you'll probably like this too. If you've got a lazy Saturday and are looking for a marathon TV series session this is a good one to go with. You've got action, intrigue, a good plot and Al "feed him to the pigs" Swearengen (Ian Mcshane) from Deadwood playing the villain, you can't go wrong here. Why is it in your queue? My sister told me about it. Is it artsy? Nope, some of the dudes wear tights though. Best thing about the movie? Al F'n Swearengen. What mood should I be in to watch this movie? In a lazy, rainy Saturday kinda mood.